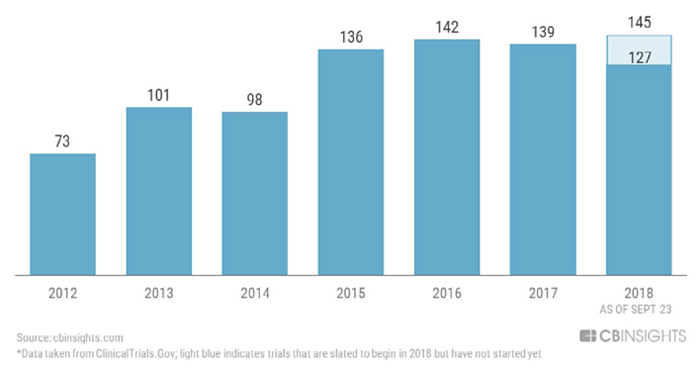 But with longevity clinical trials nearly doubling, from 73 in 2012 to over 145 in 2018, more answers — and questions — are emerging than ever before. Here, in Part 2 of a series of blogs on Longevity & Vitality, I explore how genome sequencing and editing, along with new classes of anti-aging drugs, are augmenting our biology to further extend our healthy lives. Figure: Clinical trials targeting aging have seen steady growth over the past 6 years. A sequence of 3.2 billion letters makes you “you.” These base pairs of A’s, T’s, C’s and G’s determine your hair color, your height, your personality, your propensity to disease, your lifespan, and so on. Until recently, it's been very difficult to rapidly and cheaply "read" these letters — and even more difficult to understand what they mean. Since 2001, the cost to sequence a whole human genome has plummeted exponentially, outpacing Moore's Law threefold. From an initial cost of $3.7 billion, it dropped to $10 million in 2006, and to $5,000 in 2012. Today, the cost of genome sequencing has dropped below $500, and according to Ilumina, the world’s leading sequencing company, the process will soon cost about $100 and take about an hour to complete. When we understand your genome, we'll be able to understand how to optimize "you." We'll know the perfect foods, the perfect drugs, the perfect exercise regimen, and the perfect supplements, just for you. We'll understand what microbiome types, or gut flora, are ideal for you (more on this in a later blog). In addition to reading the human genome, scientists can now edit a genome using a naturally occurring biological system discovered in 1987 called CRISPR/Cas9. Short for Clustered Regularly Interspaced Short Palindromic Repeats and CRISPR-associated protein 9, the editing system was adapted from a naturally occurring defense system found in bacteria. The CRISPR arrays allow the bacteria to "remember" the viruses (or closely related ones), and defend against future invasions. If the viruses attack again, the bacteria produce RNA segments from the CRISPR arrays to target the viruses' DNA. The bacteria then use Cas9 to cut the DNA apart, which disables the virus. Most importantly, CRISPR is cheap, quick, easy to use, and more accurate than all previous gene editing methods. As a result, CRISPR/Cas9 has swept through labs around the world as the way to edit a genome. 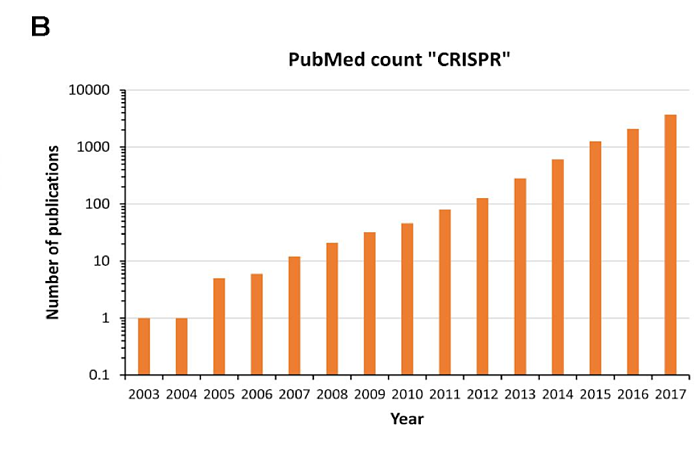 Figure: Number of CRISPR mentions on PubMed 2003-2017. What normally follows next is programmed cell death or destruction by the immune system. A very small fraction of cells, however, become senescent cells and evade this fate to linger indefinitely. Senescent cells appear to be one of the root causes of aging, causing everything from fibrosis and blood vessel calcification to localized inflammatory conditions such as osteoarthritis to diminished lung function. Currently, rapamycin derivatives are widely used as immunosuppression in organ and bone marrow transplants. Research now suggests that use results in prolonged lifespan, enhanced cognitive and immune function. Metformin is a widely used generic drug for mitigating liver sugar production in Type 2 diabetes patients. The Elysium Health Basis supplement aims to elevate NAD+ levels in the body to extend one’s lifespan. Elysium’s clinical study reports that Basis increases NAD+ levels consistently by a sustained 40 percent. Figure: Results of Elysium's Clinical Study show that Basis increases NAD+ levels by a sustained 40%. These are just a taste of the tremendous momentum that longevity and aging technology has right now. As artificial intelligence and quantum computing transform how we decode our DNA and how we discover drugs, genetics and pharmaceuticals will become truly personalized. The next blog in this series will demonstrate how artificial intelligence is converging with genetics and pharmaceuticals to transform how we approach longevity, aging and vitality. Each year at Abundance 360, I host a panel of world-class longevity researchers and CEOs to update our members on the current state and near future of these technologies. Next week, I’ll be joined by Dr. Robert Hariri, Founder and CEO of Celularity, legendary investor Jim Mellon of Juvenescence, and Dr. Joan Mannick, Co-Founder and Chief Medical Officer at resTORbio for a conversation on Longevity and Vitality. To join us via livestream, visit abundancedigital.info to apply for my Abundance Digital Community. We are edging closer toward a dramatically extended healthspan — where 100 is the new 60. What will you create, where will you explore, and how will you spend your time if you are able to add an additional 40 healthy years to your life?